There is no time like the present to be sanitary. Unfortunately, we often forget that clean beer lines are one of the most important steps in serving delicious beer. With the tools and instructions provided, this should take you no time at all, let’s get to it! Why is cleaning the lines important? Beer lines require periodic cleaning because beer leaves behind yeast, protein and mineral deposits that can affect the taste and smell of your beer. Mold can also find its way into your draft system fittings through exposure to air. If left untended, these factors can create a scale called calcium oxalate, commonly referred to as beer stone, which forms on the fittings, lines, and taps. If beer stone is not completely removed in a cleaning process, it will leave an unsanitary surface that can harbor microorganisms. Microorganisms or bacteria will grow very quickly if a sanitary environment is not maintained, which will affect the flavor and shorten the shelf life of your beer. Regular cleaning with the proper equipment and chemicals eliminates the build-up of beer stone, assuring that bacteria does not have the opportunity to reach the levels which affect the quality or taste of the beer and protecting the integrity of the product. Lines should be cleaned on a regular basis to prevent beer stone build-up. We recommend that you clean your lines about every 6 weeks or every time you switch out a keg. Commercial applications require more frequent cleaning, depending on the beer system length. Systems less than 25′ in length require bi-monthly cleaning, while longer systems should be cleaned following brewery recommendations and/or state guidelines. If you go longer and beer stone has already formed inside the lines and fittings, you will need to use an acid line cleaner in addition to the beer line cleaner to remove alkali resistant build-up. It is also recommended to clean the lines if the system will not be used for awhile to prevent yeast build-up and sediment in the beer line. It is important to only use chemicals specifically designed and manufactured for beer line cleaning. Only chemicals specifically designed for beer line cleaning will dissolve the build-up of beer stone, bacteria, mold and yeast without leaving behind any harmful residue. Be safe and follow all the directions on the cleaning chemicals completely. We offer different types of cleaning kits to fit your needs and your budget. Our kits range from gravity-driven containers that attach to your faucet to re-circulating beer line cleaning pumps for commercial applications. For the everyman, hand pump and pressurized kits are sufficient for cleaning out short draw beer lines and keeping your beer tasting great. I’ll review a few different styles to help you choose the right one for your application. 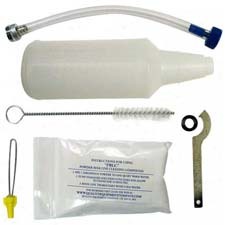 A gravity driven cleaning kit, like the Economy Keg Beer Line Cleaning Kit, is an economical way to clean your lines. It is not as efficient as some of the pump driven or pressurized cleaning kits, but it’s easy on the wallet and gets the job done. With any cleaning kit, the first thing you will need to do is remove the keg coupler from the keg and put it in a bucket to catch the cleaning solution after it makes its way through the beer line. 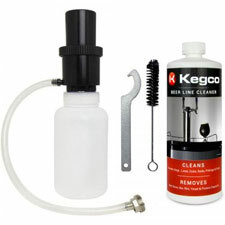 To use the Kegco Economy Beer Line Cleaning Kit, you must first remove the faucet from the faucet shank so that you can connect the tube on the cleaning bottle to the faucet shank. A faucet wrench is provided with the kit to help get leverage on stubborn faucet collars. Put the faucet in the bucket along with the keg coupler so that it can soak in the cleaning solution once it’s passed through the line. The kit includes enough powder line cleaning compound to get you through 17 cleanings. Mix the specified portion of powder compound with the proper amount of water in the cleaning bottle according to the instructions on the cleaning compound. Once the solution is mixed and the bottle is connected to the faucet shank, simply hold the bottle upside down and allow gravity to pull the solution down through the beer line and out of the coupler into the bucket. 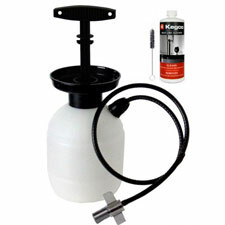 Keg couplers have a check ball inside of them to prevent backflow into the keg, so a ball lifter is provided with the cleaning kit. Insert the ball lifter into the bottom of the coupler probe to allow the cleaning solution to flow through the coupler and remove the build-up in the line. Once all the solution has run through the line, rinse the cleaning bottle, fill it with cool, clean water and run the water through the line to clean out the residue from the cleaning solution. Powder line cleaner does not mix as well as liquid cleaner, so you may need to do a couple rinses to get the reside out of the line. A faucet brush is provided with the cleaning kit which you can use to help loosen any build-up from the faucet spout and also the coupler probe. Rinse those two items before reinstalling on your draft beer system. Hand pump kits are a step up from the gravity driven kits as they allow you to push the solution through the line with pressure. The Standard Beer Cleaning Kit is similar to the Economy Kit in that it attaches to the faucet shank and moves the solution back through the line and out the coupler. It has a spring action hand pump that allows you to push the solution through the line and includes a liquid cleaning solution. The liquid cleaning solution mixes with water better than the powder compound so less rinsing is necessary. The Standard Beer Cleaning Kit is available with either a 1-quart bottle or a 2-quart bottle. The 1-quart version is sufficient for kegerators with a standard 5′ beer line. The 2-quart bottle is an option for longer lines that may require more cleaning solution. The Deluxe Hand Pump Pressurized Cleaning Kit is the most popular cleaning kit based on the price and ease of use. It connects to the bottom of the beer line and pumps the solution forward through the line and out of the faucet, so you do not have to remove the faucet each time. Just remove the fitting on the beer line from the keg coupler, attach it to the fitting on the cleaning kit and pump the solution into the line. The piston-style hand pump builds great pressure without much effort. With the faucet attached, you can allow the solution to sit in the line with the faucet closed to give it extra time to loosen any build-up, then open the faucet and allow the solution and water rinse to empty out into a bucket or pitcher. As with the other kits, a faucet brush is provided to clean the spout. 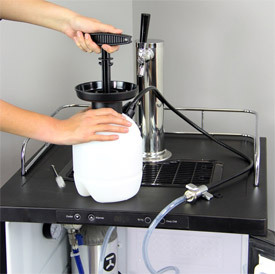 The Complete 5-liter Pressurized Keg Beer Cleaning Bottle & Tube Kit works just like a keg, using the CO2 from your dispense system to pressurize the cleaning bottle and push the liquid through the line. It has different cleaning caps available, depending on what type of keg coupler you use on your system. The keg coupler attaches to the cap just like it would a keg. The cap has a dip tube attached to the bottom of it that goes down to the bottom of the bottle. When tapped, CO2 pressure pushes on the surface of the liquid and the only place for it to go is up the tube and into your beer line. 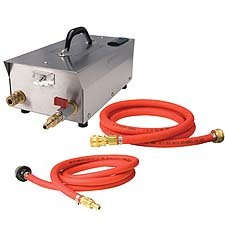 With the Pressurized Kit, you don’t have to take anything apart, which makes it very convenient. Just disconnect your keg coupler from the keg and connect it to the cleaning cap. This ease of use makes it ideal for small breweries and restaurants that don’t want a lot of downtime for cleaning. The drawback to the Pressurized Kit is that it is more expensive and uses your CO2, meaning you would have to fill your CO2 tank more often. A Cleaning Can is similar to the above kit, but it has four valves on top so you can clean up to four runs simultaneously, making it a great option for commercial environments. You can have four D system valves if all you serve is domestic beer, or you can have different valves for European kegs if you also serve imports. It can hold up to 18 Liters of cleaning solution at once, so there is less downtime needed for filling up the can with chemicals. Home Brew enthusiasts using soda kegs that can be opened and re-sealed can simply use their keg as a cleaning kit. Simply mix the cleaning solution with water inside your keg and pressurize it like you’re pouring a beer to clean and sanitize your kegs and beer lines at the same time. For long draw commercial systems over 20 feet, the best choice for clean lines is to re-circulate the cleaner through the line to give the lines more exposure to the cleaning chemicals. The Re-Circulating Beer Line Cleaning Pump allows for a steady flow of beer line cleaning chemical through your lines for a set time frame (15 minutes recommended). The combination of friction and pressure with chemicals greatly elevates your cleaning ability. Think of it this way: you wouldn’t just drop soap on your hands and rinse it off without scrubbing them together first… the same goes for your beer lines. We have a full line of chemical cleaners to use along with your kit. 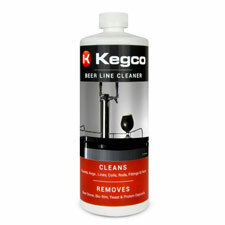 Alkaline cleaners, like the 32 ounce bottle of Kegco Beer Line Cleaner, are ideal for maintaining an optimal dispensing environment with regularly scheduled cleanings. At 1/2 oz. of cleaner per quart of water, a 32 oz. 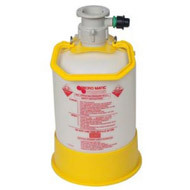 bottle makes 64 quarts (16 gallons) of powerful, quality cleaner. Tracers like the Draftec Advanced Beer Line Cleaner Blue Tracer leave a colored residue in the line so you can tell when it is fully rinsed out of the line. ALC Acid Post Wash Beer Line Cleaner can be used in conjunction with Beer Line Cleaner to remove alkali resistant calcium oxalate. We also offer cleaning brushes to help loosen the sediment in your lines, couplers and fittings. Feel free to contact us at 1-800-710-9939 with any questions you have regarding proper beer line maintenance. Keep those lines clean and enjoy your fresh, delicious draft beer! Draft Beer Beer Lines, Clean, How-To. permalink. Why can’t I just put BLC in a clean keg and push it through the lines with CO2?